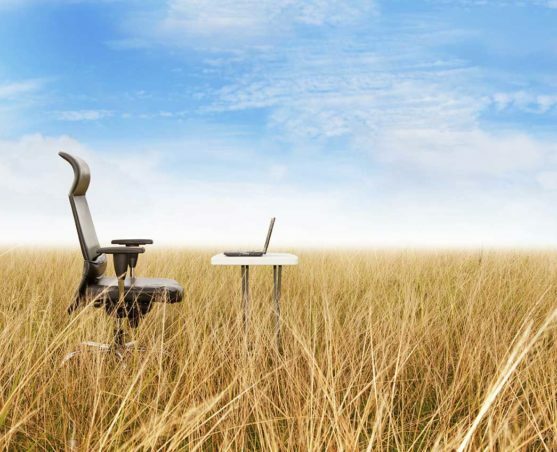 But there’s a cheaper path to broadband access for rural America: TV white spaces. TV white space is unused radio frequency spectrum, either buffer zones between channels or entirely unused channels. White space provides wireless Internet connection to anything with connection capability. 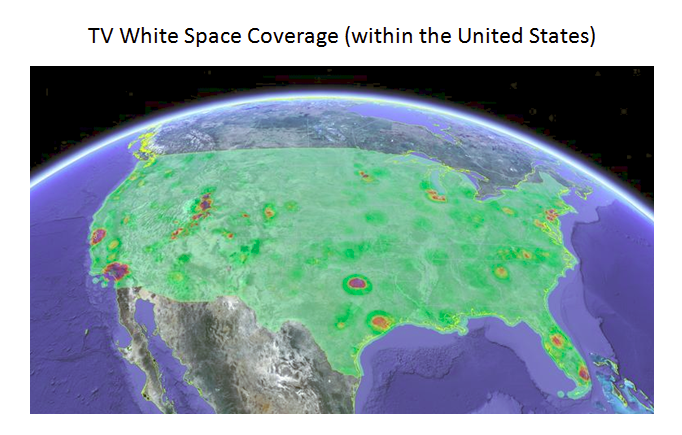 Most importantly, white space coverage is nearly universal, blanketing a much larger area than broadband. 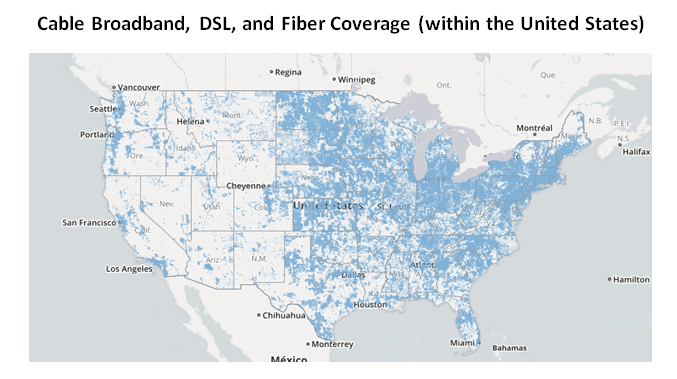 The two maps below compare the coverage extent of TV white space to broadband, DSL, and fiber combined coverage in the United Sates. Infrastructure costs for white space are inexpensive compared to cable or fiber broadband. There’s no need for pricey underground installations. Rather, TV white space uses the same infrastructure as, predictably, a TV broadcast. One broadcast station can project broadband over a nine mile radius, even in rough terrains. Considering that 301.7 million or 94% of all Americans live in homes with a TV, such infrastructure would reliably deliver broadband almost anywhere. Providing Internet with TV white spaces isn’t some fledgling venture experiment. Hospitals and megachurches already use white space freely. In many hospitals, medical telemetry devices connect patient vital monitoring to wireless white space Internet with antennae and centralized receivers. This allows soon-to-be patients traveling in ambulances to upload vital signs to hospital computers before arrival. Doctors can monitor patients from anywhere in the hospital complex. Megachurches use white space for wireless microphones at Christian services. Broadway theaters and the NFL use white space similarly at their own venues. So why aren’t we using this great technology? It comes down to government regulations, specifically, licensing requirements. The Federal Communications Commission (FCC) controls and allocates the radio spectrum for all United States users, excluding the federal government. For many years, the FCC prohibited most unlicensed white space usage, due to concerns of signal interference with licensed users. This changed in 2010 when the FCC adopted final rules that permit unlicensed radio transmitters to use white space within regulatory guidelines that safeguard against interference. Further deregulation for white spaces followed in 2015. Even though interference problems are a thing of the past, there are too few channels allocated for unlicensed white space to reliably provide private broadband services. For a company like Microsoft to create a white space broadband market, three channels, or at least 18 megahertz of spectrum need to be available. Thankfully, however, the FCC may unleash free-market TV white space Internet services. FCC Chairman Ajit Pai recently completed a tour of rural America, including states like Wyoming and Wisconsin. During this tour, he sought input from rural communities and companies as to how the FCC can improve Internet access. One solution Chairman Pai will reportedly consider is expanding the private market for TV white space. In July, the FCC is likely to host a hearing about further white space innovation, specifically by preserving three channels for white space usage. If this hearing leads to rules establishing markets for affordable white space broadband in rural America, universal Internet coverage is a step closer. Tweet to FCC Commissioner Ajit Pai (@AjitPaiFCC) and tell him that you support TV white space broadband. I myself am from the suburbs and I want to say that the provider is not difficult to find here. However, if the man is going 5 or 10 who need it, then easily agree. It is a misconception that there is no civilization beyond the suburbs. Vaughn one ordered a car over the Internet https://chims.ch/, so everyone knows about it. Who need to find themselves and quality service for the selection of machinery and provider if you want. How to conform the use of the Maine and more working of the best of the user and enjoy the working and not more conform the single https://windowsclassroom.com/defrag-windows-10 connection on demand.this is the right choice and you will conform the function. WASHINGTON, D.C. - FreedomWorks is disappointed in Rep. Mike Coffman’s (R-Colo.) decision to join forces with the far-left on Title II regulation of the internet. A repeal of the Restoring internet Freedom Order will reinstate a harmful, heavy-handed regulatory framework for the internet that will stifle innovation and reduce consumer choice. WASHINGTON, DC - Amidst the series of recent proposed media mergers, FreedomWorks encourages the FCC to approve the T-Mobile/Sprint merger. FreedomWorks has continuously advocated non-intervention on similar mergers.